Mitochondria are organelles that are found in every cell in the human body. Mitochondria are the cells’ power sources. They are distinct organelles with two membranes. Usually they are rod-shaped, however they can be round. Mitochondria convert the food we eat, more specifically carbohydrates, along with oxygen and nutrient co-factors into cellular energy. The food we eat is oxidized to produce high-energy electrons that are converted to this stored energy. This energy is stored in high energy phosphate bonds in a molecule called adenosine triphosphate, or ATP. Let’s break down each of the steps so you can see how food turns into ATP energy packets and water. The food we eat must first be converted to basic chemicals that the cell can use. Some of the best energy supplying foods contains sugars or carbohydrates. Let’s take bread, for example. Using this as an example, the sugars are broken down by enzymes that split them into the simplest form of sugar which is called glucose. The pancreas releases insulin molecules which “dock” on the cell’s membrane. Then, glucose enters the cell by special molecules in the membrane called “glucose transporters”. Once inside the cell, glucose is broken down to make ATP. That process is done with the Kreb’s cycle inside the mitochondria. This ATP is generated with glucose and oxygen (magnesium, CoQ10 and some other helpers). It then runs all of the cells functions. Like a car can not run without gasoline, our cells cannot function without ATP. 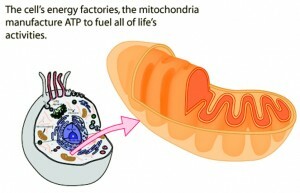 So mitochondria make the “gas” our cells run on. Oxygen is required to run the Kreb’s Cycle. Without adequate oxygen, adequate ATP is not produced and our cells don’t have energy. What kind of things can damage mitochondria or affect their ability to produce energy? Oxidative stress is one of the primary things that can affect the mitochondria. Oxidative stress occurs as damage to our DNA and the cells themselves. Oxidative stress occurs as a result of free radicals. A “free radical” is any atom or molecule which has an “unpaired electron”. It is these free radical molecules which rapidly react with other molecules, setting off a chain reaction of free radical formation, somewhat similar to an atomic explosion. So now we have this molecule which is missing an electron and is dying to get its hands on an electron to help fill its need. This free radical now goes and steals an electron from another molecule that is more willing to give one up and thus it becomes satisfied, but now the victim molecule has become a free radical! We therefore call this process the chain reaction of free radicals. Constant free radical bombardment damages the mitochondria and eventually kills the cell. When free radicals kill or damage enough cells in an organ, the organ doesn’t work well. When our organs begin to fail, eventually we die. To prevent free radical damage the body has a defense system of antioxidants. Antioxidants are molecules which can safely neutralize free radicals and terminate the chain reaction before the mitochondria or cells are damaged. What is the best game plan to reduce free radical damage and help our mitochondria and hence our cells recover? 1. Increase free oxygen to your mitochondria- i.e. with Mild Hyperbaric Chamber sessions at YOLLO Wellness. Also in home rentals and chambers to lease to own. 2. Provide specific nutrients to “supercharge” your mitochondria, so they produce more fuel (ATP). Knowing what foods your body is utilizing is extremely important. Do you have your specialized food plan as a result of your blood testing results? At YOLLO Wellness we get you started and see you through your results. We personally draw your blood, send it to ALCAT for the analysis, help you implement your new plan and soon you will be feeling great again! 3. Take the right blend of antioxidants to help repair and prevent free radical damage. Unlike any other micronutrient test you’ve ever had before, this one takes the average of how you have been absorbing the “vitamins and amino acids” over the past 4 months and gives you the exact daily amount of how much to take if you are deficient. 4. Monitor the shape of your cell, what’s in the plasma, presence of free radicals, acid and more with a live blood cell analysis. This is a visual of how you are absorbing the food and micronutrients. This is available at YOLLO Wellness. Learn how Hyperbaric Oxygen Therapy can enhance your life! Contact us to schedule consult today. Please note: a prescription is required for hyperbaric oxygen based on the FDA regulations. Previous Could Treating Lung Disease Lower Your Risk for Dementia? Next HydraFacial MD® Award-winning noninvasive hydrating skin rejuvenation.